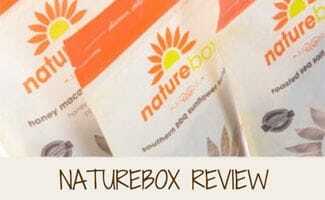 Home > Health > Food > NatureBox Reviews: The Best Healthy Snacks at Your Doorstep? Are you into healthy snacks but tired of your local grocer’s options? Why not consider getting a healthy snack box delivered right to your home on a regular basis? NatureBox is the most popular — and in our assessment — the best healthy snack box subscription service you can find on the market. Read on to see why they rank number one in our book, beating out a number of other providers we’ve reviewed! NatureBox lets you choose how often you want to receive your healthy snack box delivery: weekly, bi-weekly or monthly. After your first shipment, you can opt to add up to 20 snacks per box. NatureBox Canada: USD box pricing is the same in Canada, but shipping costs $4.95 per month. Office Snack Boxes: NatureBox has a variety of office snack boxes, but you must contact them for pricing. Naturebox often has time-sensitive coupons that can be seen via this link. How Do Customers Rate NatureBox? See below for some NatureBox customer feedback we’ve found from reliable online resources. What Are GMO Food Products? GMO foods are genetically modified foods that many of us earth-conscious consumers consider unnatural and potentially unhealthy. Fortunately, NatureBox offers many non-GMO snacks. To learn more about the evolution of GMO foods, watch the video below by Scientific American. Statistics show that Americans want to change their snacking habits. “While nearly three-quarters of consumers wish there were more healthy snack options, more than three in five agree taste is more important than how healthy the snack is for them,” reports Mintel.com. The stats aren’t entirely surprising, but we would argue that most Americans simply don’t know where to find tasty, healthy snacks. NatureBox is a great source for healthy and tasty snacking. That’s why it is our #1 choice for the best healthy snack subscription box in our comparison of healthy snack box delivery options. Their selection of healthy snack options surpasses most stores and online box subscriptions. But be sure to read our article to see other healthy snack box subscription options for alternatives to Nature Box. I’ve used Nature Box and can speak from experience that these are nutritious and delicious! Love having these around the office to snack on or to throw in the kid’s backpacks for school.